Perhaps the most common inquiry I receive from prospective world readers, however, concerns children’s books. I’ve lost track of the number of parents and teachers who have written to me asking for advice on resources they can use to help youngsters read more widely. It’s great to know that so many children are surrounded by adults keen to help expand their imaginary universes in this way. Although during my quest I only read two books aimed specifically at children (my choices for Dominica and for the Central African Republic) and one YA novel (Samoa), my literary adventures have brought me into contact with a number of great projects exploring children’s literature from around the world. In the UK, for example, the wonderful Outside In World organisation has done a lot to bring more great books onto British children’s radars. Meanwhile in New York, this list compiled by Marianna Vertsman at Mid-Manhattan Library is a great starting point. 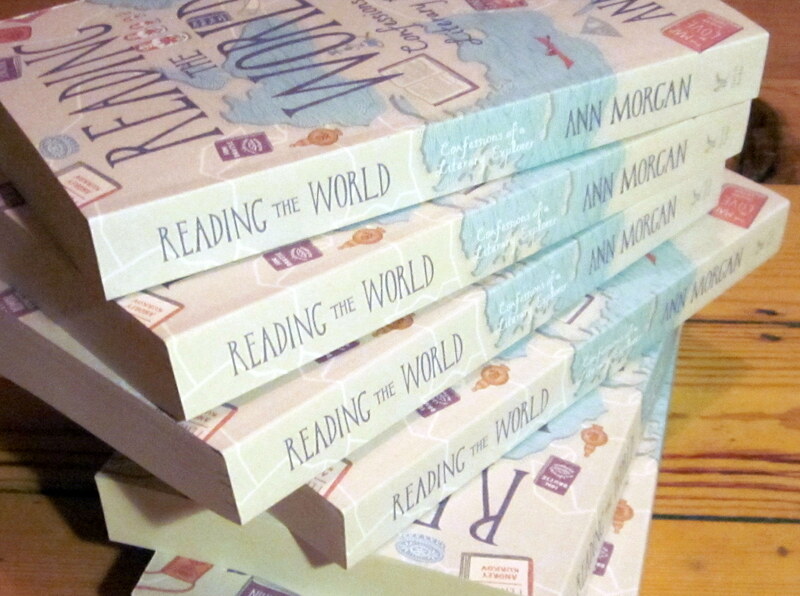 There are also some wonderful personal projects, such as the Read Around the World section on mother-of-three Amy’s Delightful Children’s Books blog. In my reading this year, I was also enthralled by Helen Wang’s wonderful translation of Cao Wenxuan’s Bronze and Sunflower, a glorious children’s story set in rural China during the Cultural Revolution. I made it my April Book of the month and I’ve been very pleased to see that it’s been getting some much deserved attention in the UK Independent and Guardian newspapers this week. But, as you’ve probably gathered from this project, I’m a great believer that you can never have enough book recommendations. So I thought I’d see what you’ve got to add to the discussion of children’s literature from beyond the English-speaking world. And because it’s the festive, gift-giving season in many parts of the planet and I’m feeling generous, I thought I’d offer you the chance of getting a signed copy of my book in return. Simply leave a comment below giving the title and author of your favourite children’s book written in a language other than English, and up to four sentences about why you like it. Your recommended title can be available in translation or yet to be translated, and it can be a picture book or full of words. My main criteria are that you love it and that it’s good. On January 1 at midday UK time, I will read through all the entries and choose my favourite, most persuasive book pitch. 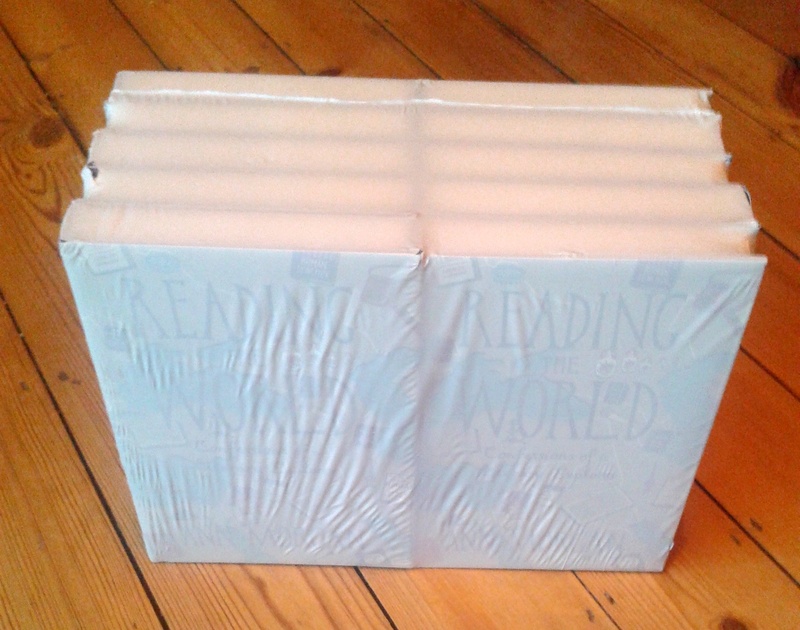 And that person will get a signed copy of the UK edition of my book, Reading the World (pictured above). I’ll even personalise the dedication and post it to you and everything. So go on, tell me what children’s stories we English-language readers are missing. A rather lovely email arrived in this morning. The message was from Rafidah, the generous stranger who, four days after I first asked the planet’s booklovers to help me read the world, left a message offering to go to her local English-language bookshop in Kuala Lumpur and choose and post me my Malaysian book. 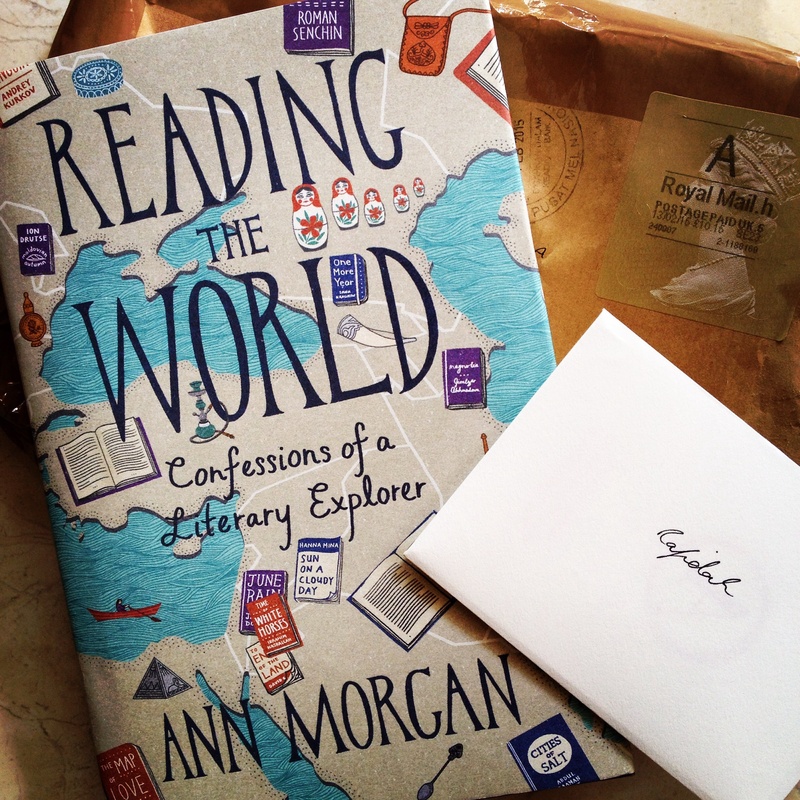 Rafidah’s kindness was a great inspiration for me at the start of this project and so, when Reading the World: Confessions of a Literary Explorer was published earlier this month, I emailed her to ask if I could send her a copy in return for the books she once sent me. The photograph above shows my book and the card I enclosed in Rafidah’s apartment, where my parcel has just arrived. More than three years after her act of generosity kickstarted my quest, the book that it led to has found its way to her. I’m so pleased. One of the lovely things to come out of this project is the fact that I’m often invited to go and speak to people about reading and the world. From standing on stage at International Translation Day talking to a packed audience of translators (eek! – actually they were lovely) to speaking to a handful of booklovers in a yurt at the Wise Words Festival in Canterbury last September, I’ve been privileged to share these adventures with many people and I’ve met some fascinating bibliophiles along the way. I have to confess, however, to being particularly excited about an invitation that I’ll be taking up soon: in March I’ll be flying out to Geneva to talk at a TEDx event organised by Procter & Gamble. As anyone familiar with the TED format will know, this involves speaking to an audience (in my case of about 300 people) while being filmed by several cameras. The film is then edited together and shared free online. It’s a fantastic opportunity and a great honour to be asked, but it’s not a little daunting too. As a result, I am spending a lot of time preparing and will be watching many TED talks in the coming weeks. I’ve shared my favourite above – the Nigerian novelist Chimamanda Ngozi Adichie’s talk on ‘The Danger of a Single Story’, which she delivered at TEDGlobal in 2009. This was a big inspiration for me throughout my project and kept me conscious of trying to avoid falling into the trap of thinking that one book can stand for a nation. But I’d be really interested to hear your recommendations. Are there any TED talks that have stood out for you? If so, what was it about them that made them particularly powerful? Any thoughts would be very much appreciated. Thanks! It’s a moment every debut writer waits for: that first reader review on Amazon. The point when an ordinary person, somewhere out there in the world responds to your work. For me, that moment came yesterday afternoon. I’d clicked onto my book as I do most days (all right, every day at the moment) to see how it was performing and found that Reading the World had scored its first rating: one star. Anxiously, I flicked down to the write-up. Had the reader thought the writing was bad? Did they hate my ideas? No – at least they didn’t say so. As it turned out, the one-star rating was down to the fact that the book wasn’t what the reader expected. They had been hoping for an account of the 196 books I read in 2012 and because the book didn’t conform to their expectations they had marked it down. 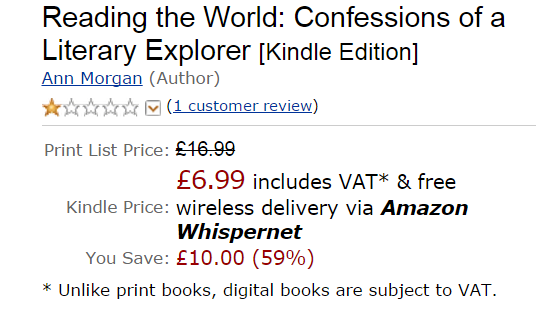 The Amazon reviewer isn’t the first person to have expected Reading the World: Confessions of a Literary Explorer to be a blow-by-blow description of my year of reading the world. In fact, when I first got the book deal back in 2012, I assumed that that was the form the narrative would take. I even wrote a first draft to that effect, weaving in a lot of material from my online reviews and roughly following the chronology of the year. Then (with the help of my editors at Harvill Secker) I realised two things. The first was that anyone who wanted a story-by-story rundown of my literary quest didn’t need to go to the bother of buying a book: that material was already online for free. Anyone who went to the list and clicked on a country name could find my account of what I read for that particular nation. It seemed rather limited to package all that openly available material up and expect people to pay for it. The second realisation was that the 196 books I read that year (well, 197, counting Kurdistan) were sort of beside the point. They were my solutions to the challenge at a particular time and place, but someone else reading the world would find and pick very different things – as the ever-growing selection of recommended titles on the list demonstrates. I had never set out to source the definitive work for each country (given that I’ve only read one book from many nations, I’m certainly not qualified to do that). Instead, I was interested in exploring and seeing what I could find. What intrigued me most, I discovered, was not the specific choices, but how they changed my thinking and the big ideas they brought up along the way. I wanted to explore how reading the world can remake us as people and challenge the assumptions that we all grow up with, wherever we’re from. And I wanted to examine why storytelling matters to us and how it has shaped the lives of many of the people I encountered during my quest. To this end, I decided to structure the book around these ideas. I would refer to many of the texts I read during 2012, but I would also bring in lots of other stories and research too. And I would weave in some of my own experiences as a reader throughout my life. I hope it makes for a more substantial and longer-lived work than a simple collection of stitched-together reviews would do (it certainly required me to think a lot more deeply than the initial project). But that’s for readers like you to decide. For now though – until a hopefully more enthusiastic rating appears – I’m perversely enjoying the distinction of my book having the worst-possible average rating on the world’s biggest bookselling website. That’s surely got to be an achievement in its own right? So the day is finally here. Reading the World: Confessions of a Literary Explorer is published and on sale through all major e-tailers and retailers, as well as some fantastic independent bookshops too. We did it! 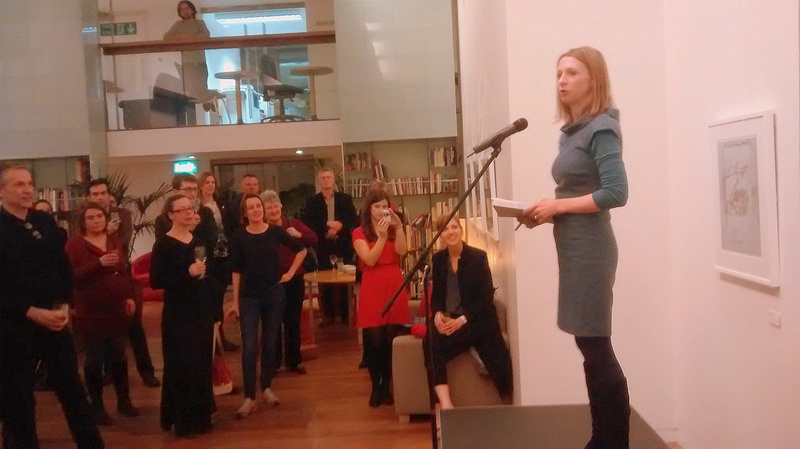 Last night I celebrated the event with friends, family, colleagues, fellow book lovers and some of the many people who helped the project on its way at the Free Word Centre in Farringdon. You can see me speaking in the photo above, which was taken by the writer Martin Goodman – one of a number of a number of authors who were there, including Hamid Ismailov, whose book The Railway was my pick for Uzbekistan. I’m not quite sure what I was saying at this point, but it was probably some kind of thank you (there were a lot of those). It was a joy to see so many people who were important to me and to the project in the same room, but I was particularly delighted by the fact that four of the volunteers who translated a book for me to read from São Tomé and Príncipe were there. 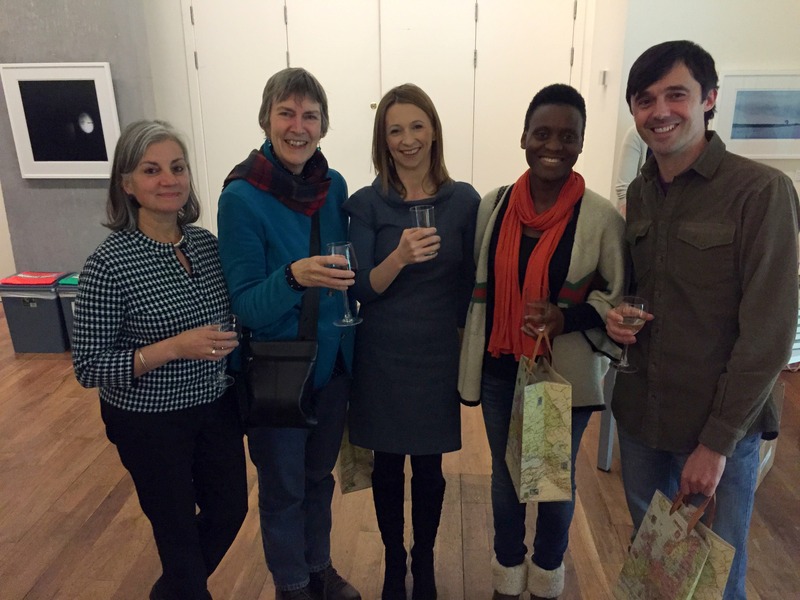 You can see us together in the picture below (from left: Clare Keats, Margaret Jull Costa, me, Yema Ferreira and Robin Patterson). It was the first time I had met three of them in person, so it was a very special moment. I was also really pleased to be able to reflect the international theme of the book in other ways. It was wonderful that the team from Belgravia Books (the home of French-literature-in-translation publisher Gallic Books) were there to sell copies of Reading the World. I signed a couple for them to take back to the shop, so if you’re passing through Victoria in the next few days you might be able to pick one up if you pop in. And when it came to the drinks, we had wine from four different countries – Slovenia, Romania, Uruguay and Greece – which was provided by The Wine Pack (@thewinepack if you want to get their tips on Twitter). They’d even made bookmarks with tasting notes and details of which book I’d read from each nation represented. There were so many wonderful things about the party. I could write for ages about the pleasure of introducing people who I knew shared common interests, reading my work aloud and seeing old friends. Unfortunately, however, I’ve got to dash. I’m about to head off into town again – this time to BBC Broadcasting House to record a discussion about Reading the World and translation for Radio Four’s show Open Book. Wish me luck! Well, not quite a movie. But a close second. This is the author film made for me by the excellent production company Vloop. The idea is to give a little flavour of what Reading the World: Confessions of a Literary Explorer is like and how it’s different from the blog. At the end, there are links to three very short extra videos about some of the highlights from that extraordinary year, as well as the film of the shelf piling up with books. I hope you like it. Seeing the finished film is a great end to what’s already been a very exciting week. In the past few days, the book’s first review has been published and I visited the Guardian newspaper’s offices to record a podcast – to be released soon. There are lots more things to come in the next few weeks as we build up to the UK publication day (or pub date, as I’ve learned it’s called in the industry) of February 5, 2015. Watch this space. A package came last night. This was inside. 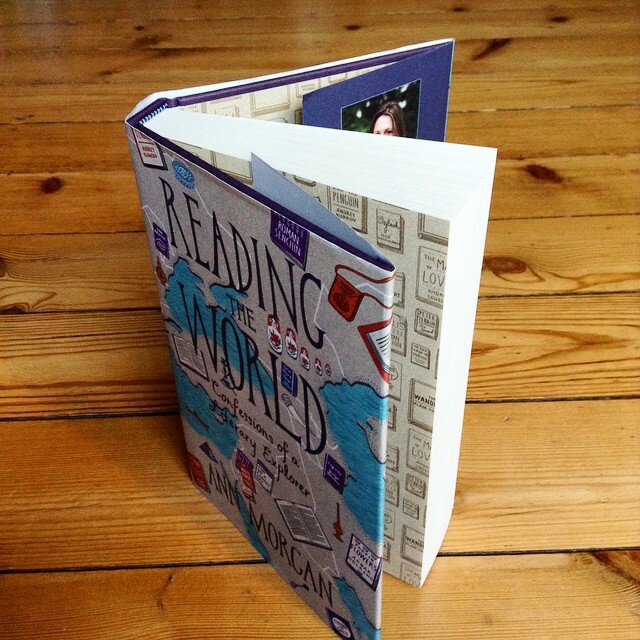 It’s the UK edition of the finished book, the book that so many of you helped make happen. If you look closely, you can just spot me peeking up from the author photo on the inside back cover. You can’t see it from here, but I am grinning in that photo almost as much as I am now. Roll on the UK publication date of February 5, 2015! Yesterday, I got an email from my UK editor, Michal Shavit at Harvill Secker/Random House. She said the uncorrected proofs of Reading the World had arrived. Unable to be in the same city as my book without holding a copy in my hands, I made a detour on my way to visit a friend and stopped off at Random House in Pimlico. This little pile of beauties was waiting for me – six of only 80 produced to be sent out to journalists and reviewers in advance of publication next year. They’re not finished – there are still some proofreading things to catch and one or two loose ends to tie up – but they are pretty close, a sort of dress rehearsal for how the book will be. I stuffed them into my trusty Daunt Books bag and scurried off, eager to have a good look. Over the next few days I’ll be combing through the pages and going over the queries from the proofreader to try to catch any last slips and typos before it all goes to press for the final time. 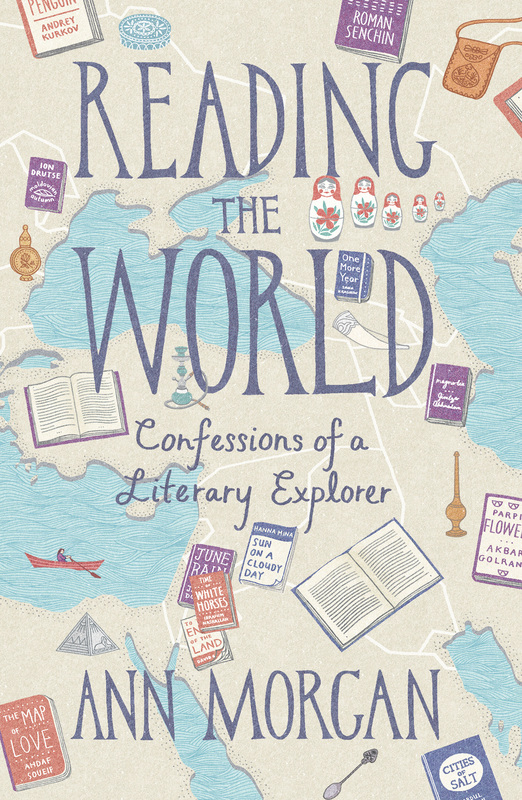 I am delighted to share the cover of Reading the World: Confessions of a Literary Explorer, which will be published in the UK by Harvill Secker/Random House on 5 February, 2015. The clever designers behind it (who have also created jackets for books by the likes of Haruki Murakami, Ian McEwan and Graham Greene – eek!) have worked hard to weave in lots of elements from the original project. Look closely and you’ll see some of the titles from the list featured on the map, along with a number of objects from different regions. I love the warm and personal feel of it. And I’m also fascinated by how different it is from the US cover, which I’ll share with you around this time tomorrow.